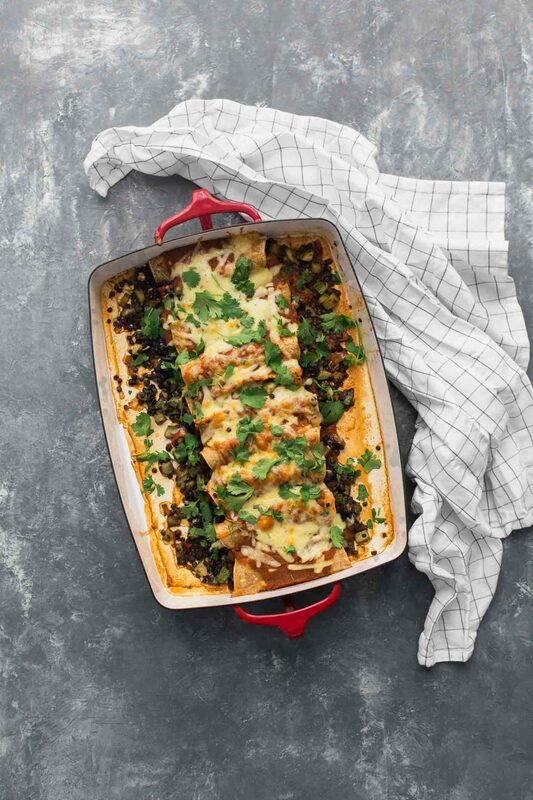 Black Lentil Enchiladas with Zucchini | Naturally. Post sponsored by nuts.com. See below for more details. 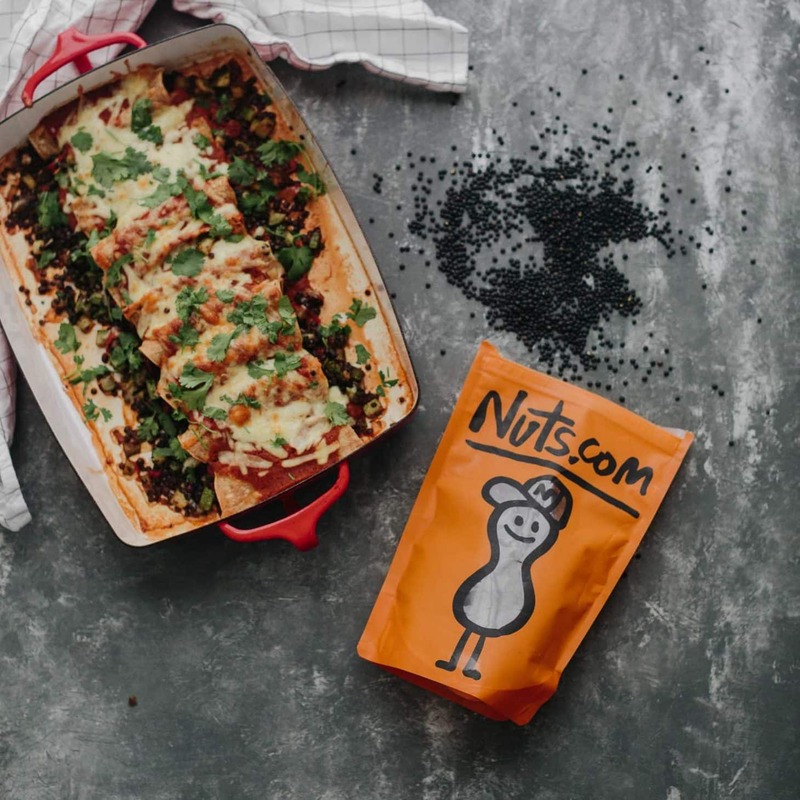 In wrapping up my three-series post highlighting black lentils with nuts.com, I wanted to share one of my favorite recipes. It’s fairly obvious that I love making enchiladas but I just find something magical in a delicious filling nestled in a fresh corn tortilla and topped with flavorful sauce. The combinations are endless but over the years, using black lentils has become a go-to. While it’s not traditional, I don’t always have cooked black beans on hand and my craving for enchiladas usually strikes an hour before dinner. Using black lentils makes a bit quicker work of the filling since the lentils cook along side the filling. Best of all, you can make/assemble these enchiladas ahead of time and freeze until ready to bake. 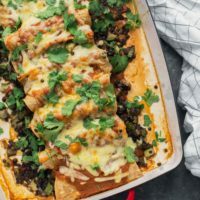 Flavorful summer enchiladas made with zucchini and black lentils along with an easy year-round homemade enchilada sauce. Rinse the black lentils and place in a medium pot. Add the water followed by the cumin and salt. Bring to a boil, reduce to a simmer, cover, and cook until lentils are tender and water is absorbed, 25 minutes or so. While the lentils are cooking, heat a large skillet over medium heat. Add the oil followed by the diced onion, pepper, and salt. Saute for 4 to 5 minutes, then add the zucchini. Cook, stirring occasionally, until the zucchini is tender and browning. Stir in the cooked black lentils, taste, and adjust salt if needed. While the filling ingredients are cooking, combine the ingredients for the sauce in a blender. Puree until smooth. Pour the remaining sauce on top and sprinkle with remaining cheese. Bake for 25 to 30 minutes or until the sauce is bubbling and the cheese has melted and browned. Tips & Tricks: I prefer to use toasted, whole spices that I grind right before using. If you go this route, use the same amount of whole spices before grinding. As for the chipotle- the sauce has a bit of a kick. Start with just a bit, taste, and adjust to your liking. You can also use chipotle powder in place of the chipotle in adobo. Start with 1/4 teaspoon and work your way up. As I mentioned above, these enchiladas are super flexible. Add more vegetables, leave out the cheese, or change the sauce- it’s up to you to use what you might already have on hand. Sauce: I usually alternate between three sauces: this chipotle version, a non-chipotle fresh tomato based version, and this tomatillo sauce. 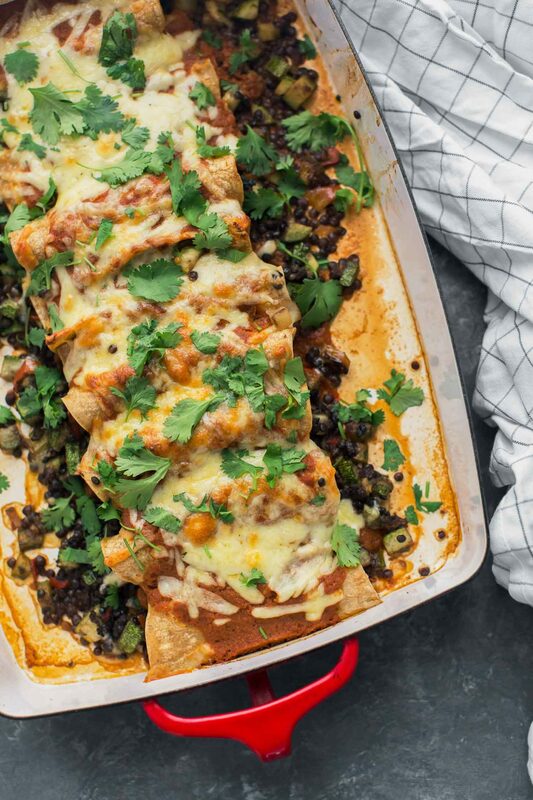 Any of these sauces work well with these black lentil enchiladas- use what you have on hand! 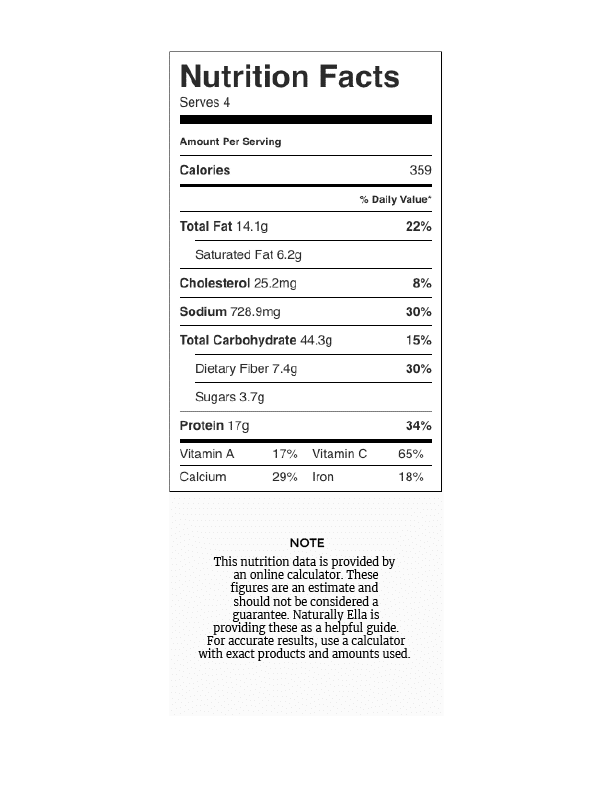 Vegetables: During the summer months, I usually add sweet corn to the mix. During the cooler months, these enchiladas work well with roasted sweet potato and/or butternut squash. Vegan: Leave off the cheese, bake, and then top with fresh avocado to give the enchiladas a bit of pop. If I could only keep one type of lentil on hand, it would be black lentils. They cook up quick and can be used in everything from stews to salads. Plus, the soak in all the good flavors while they cook. These lentils are also my favorite taco filling, so it’s a must that I always keep them on hand! My daughter and I made this last night and it was INCREDIBLE!! Not a smidge left in the pan. Thanks for another brilliant recipe! I hate to be THAT person, but here goes: Could I use black beans instead of black lentils? Ha! Black beans would be just perfect in place of the lentils!